Hotel Gaviota Porto Santo is located next to Baracoa Bay and close to the airport, in a small and private beach where, according to legends, Christopher Columbus planted the famous Cruz de Parra, considered the oldest religious object conserved from the Spanish presence in America. Hotel has 60 rooms and its best feature is a large swimming pool with a deck and thatched-roof bar overlooking the bay, downtown Baracoa and cute private cove beach. 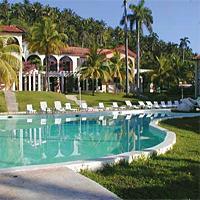 From the hotel, you can tour the mountains, admire La Farola viaduct or go on a trip in "cayucas" on the Toa River. 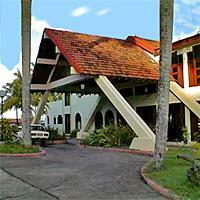 Standard rooms are not very large but nicely decorated and have magnificent view of the bay or downtown Baracoa. Bathrooms at the hotel are quite small but fully functional. All rooms have a small balcony or private patio. Cuba's remote Baracoa really has it all, for plenty of awe-inspiring experiences. It has Cuba's biggest rivers, mystical jungle mountains, biodiverse tropical wildlife, hillside plantations of coffee & chocolate (cacao), secluded beaches, coral reefs, the longest history, ancient traditions, vibrant culture and general spellbinding charisma. Baracoa City is situated on a bay close to the eastern tip of the island of Cuba where the Caribbean Sea meets the Atlantic Ocean. 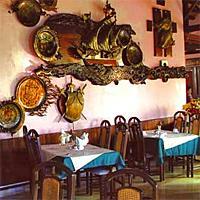 Founded in 1512 by Diego Velazquez, Baracoa is Cuba's oldest European settlement. Things are pretty laid back in this town and the abundance of palm trees along this coast give it a South Pacific feel. The fact that this was an important Spanish outpost is evidenced by the three impressive forts: Fuerte Matachin, now housing the museo municipal; Fuerte de la Punta, now refitted with a restaurant; and El Castillo de Seboruco, which is now a pleasant hotel. On calle Antonio Maceo, you'll find people queuing for hot chocolate drinks in the baking tropical sun at the Casa del Chocolate, opposite is a lovely Casa de la Trova, holding rooftop performances and you can't forget to visit Plaza Independencia (it is the focal point for community life in the city), Yunque de Baracoa and The Stone Zoo, which comprises a multitude of stone animals.